A long-term solution to damaged, decayed or missing teeth. The use of crowns and bridges for restorative dental treatment can help you to achieve a long-term answer to tooth loss or deterioration and the associated problems of shifting and weakness in your oral structure, tooth decay, periodontal disease and bone loss. Acting as a substitute for the outer layer of your natural teeth, a crown is placed over the area of remaining tooth and acts to strengthen, protect and enhance the functionality and appearance of your mouth. Crowns can be used as an alternative to fillings, where there is very little existing tooth left to support a filling, or as a means to protect a tooth that has suffered from fracturing or breakage. A bridge is a custom device anchored to neighbouring teeth replacing one or more missing teeth. When a lost tooth is replaced with a bridge, it is used in conjunction with a crown on both sides of the affected area, enabling the crowns to stabilise the bridge for an effective solution to tooth loss. Crowns and bridges can be made from a variety of materials including precious metals and porcelain for a natural and complementary method of tooth restoration. Porcelain is often the preferred material as it not only reflects the natural translucency of real teeth but is also stain-resistant and durable. Ultimately, crowns and bridges can help to rectify a number of oral problems including issues associated with a natural bite, stress to the overall mouth, strength and structure of the mouth, tooth decay and also serve to provide you with a beautiful smile for optimum oral health and vitality. 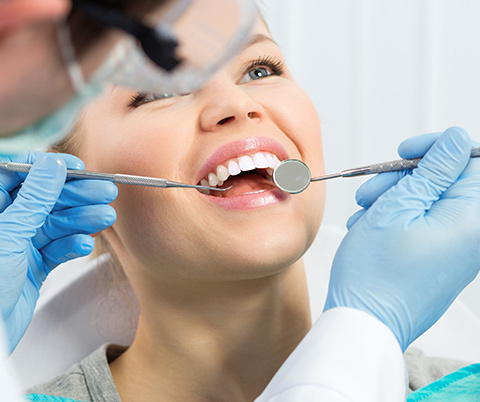 Once we determine that crown and bridge treatment is needed, a series of appointments are arranged.This initially entails a complete and thorough oral examination, including an evaluation of your dental history. Any necessary x-rays are completed at this time. During the restorative procedure, we first anesthetise the area to be treated. 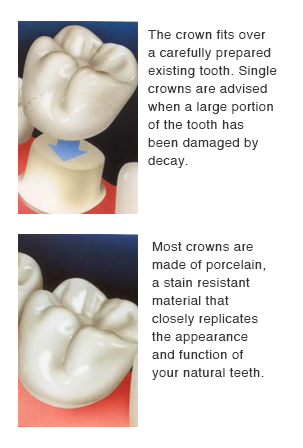 Your crown is created in a lab from a unique tooth impression which allows a dental laboratory technician to examine all aspects of your bite and jaw movements. Your crown is then sculpted just for you so that your bite and jaw movements function normally when the crown is placed. 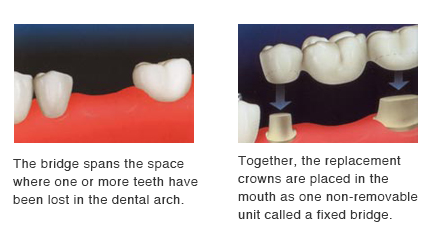 Finally, we fit the area involved with a temporary crown or bridge to protect them until your next appointment. The following appointment involves and evaluation of the final crown or bridge to ensure that they fit and complement your mouth, before placing it permanently and making final adjustments where necessary. Care for crowns and bridges should be carried out as you would do for any of your other teeth. Proper oral hygiene, including flossing at least once a day and brushing twice daily, is just as important to help you keep your teeth and gums healthy, as well as maintaining regular dental appointments. In order to make the most of your investment, it is important that you follow our recommendations – including making adjustments to your diet. For example, we recommend avoiding sticky foods like caramels, toffee, gum and crunchy foods like hard candy. And please, don’t chew ice cubes! For any further information on dental crowns and bridges, please do not hesitate to contact us and make an appointment to see Dr Christopher Smith.